Have you been to Downtown Los Angeles lately? There are so many things to see and do! 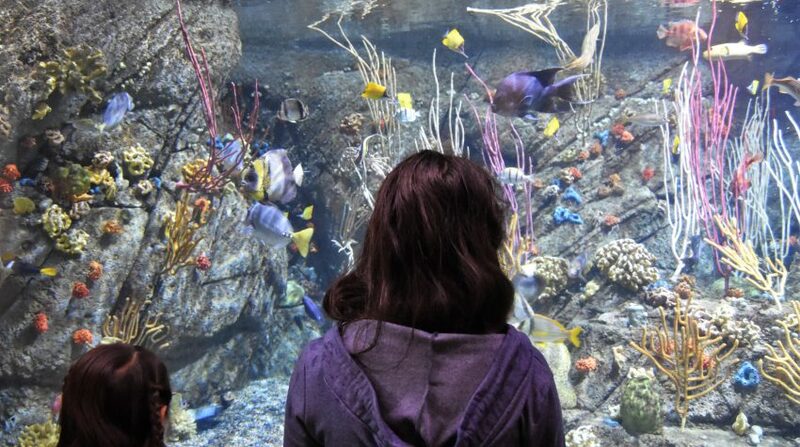 Today, we’re going to share a recent day trip we took with the family. We checked out The Last Bookstore in Downtown, followed by lunch in Chinatown. 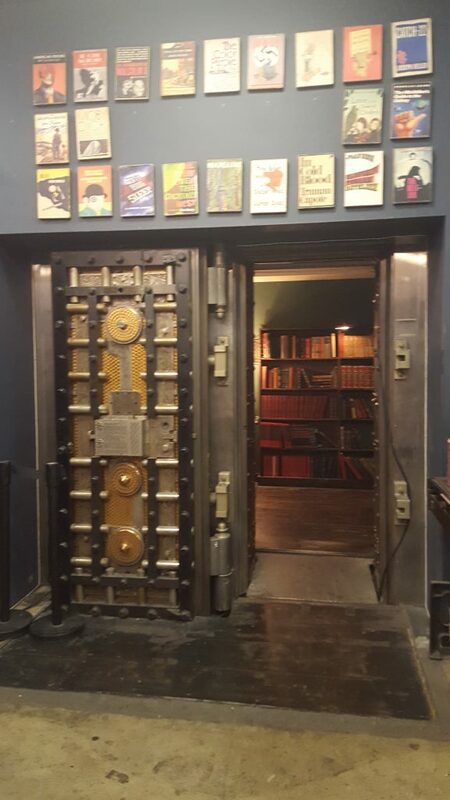 The Last Bookstore is the largest new and used bookstore and record store in California! 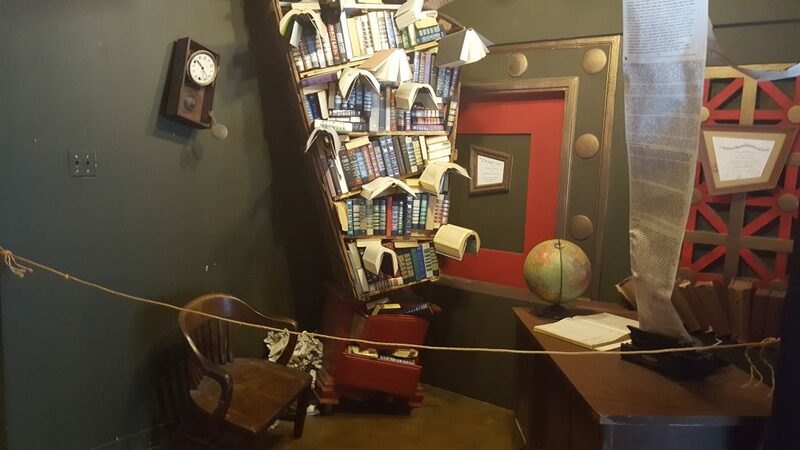 The Last Bookstore is unlike any other bookstore you have been too. It is nestled away in a Downtown LA corner. You might have passed it without even realizing it. There are some whimsical touches that will warm a book lover’s heart. 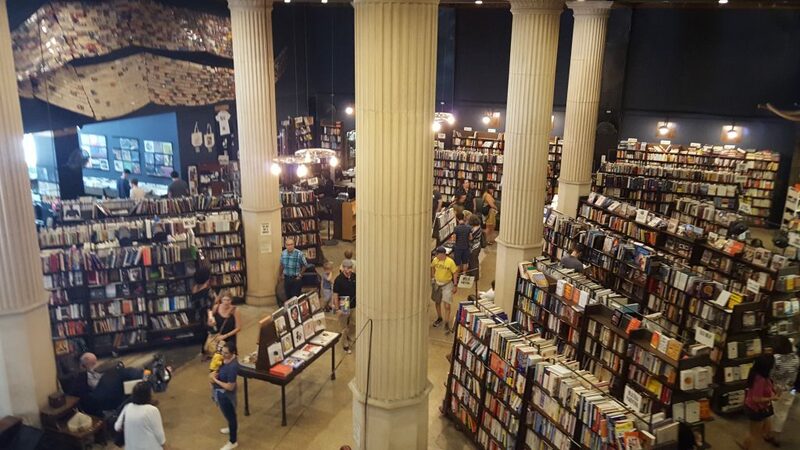 View of The Last Bookstore from the second floor. You will first enter into what looks like a huge warehouse of books. There are high ceilings, what looks like an old bank vault, and a section where vinyl records are sold. There is a section for everyone: children’s books, graphic novels, used books, new books, etc. There is a raised floor that appears to be a stage- perhaps bands play there sometimes? Either way, there are comfortable chairs all throughout for you to relax. You can flip through a few books before deciding which one might be for you. Don’t forget to check out the Arts and Rare Books annex. You will see some pretty interesting finds there. Did I mention that The Last Bookstore buys, sells, and trades books? So be sure to bring some of your books that you’re done with and see if you can sell or trade them. My absolute favorite part of this store is walking up the back stairs and finding some beautiful book and reading inspired art. The stairs themselves are charming. 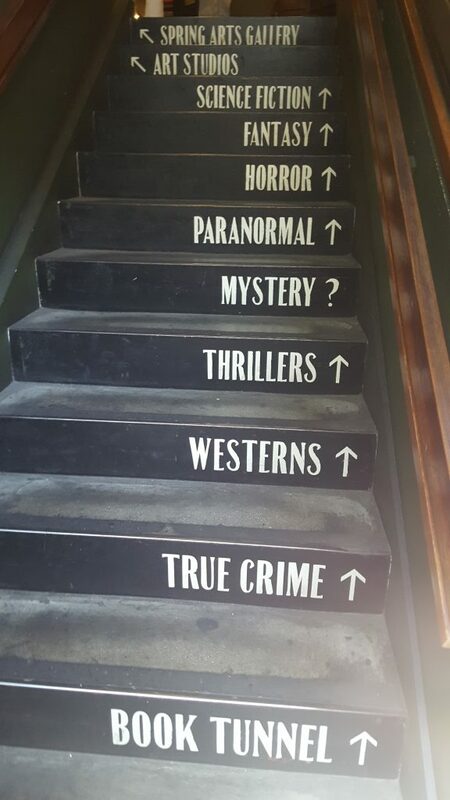 Each ascending stair has a book genre listed on it. As you ascend the back stair case, you will also find that there is some free-standing art. If you opt to use the front stairway, you will find some small retail shops on the second floor. Some shops sell art work, while others sell fun unusual items. 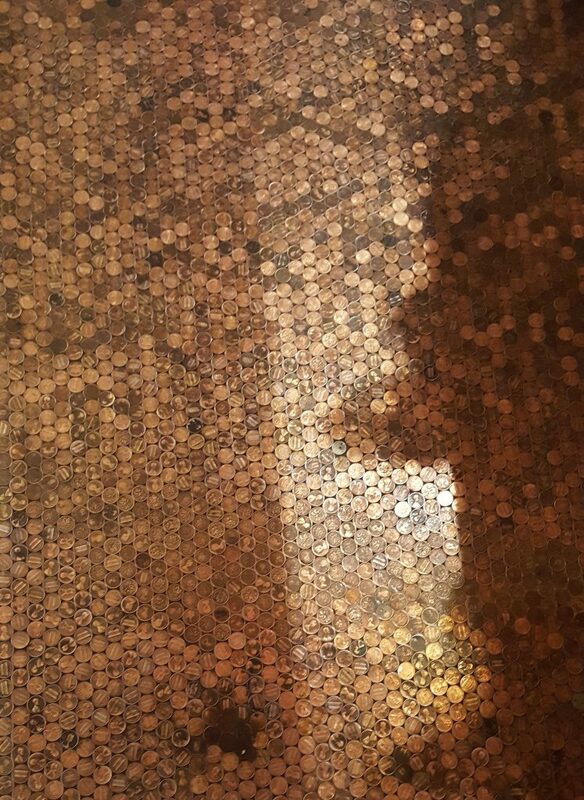 I personally loved the little details like the flooring that is made out of pennies. I also loved the beautiful architectural detail throughout the building. The ceiling in one of the hallways. As you continue to walk past the retail shops on the second floor, you will find a room full of books. 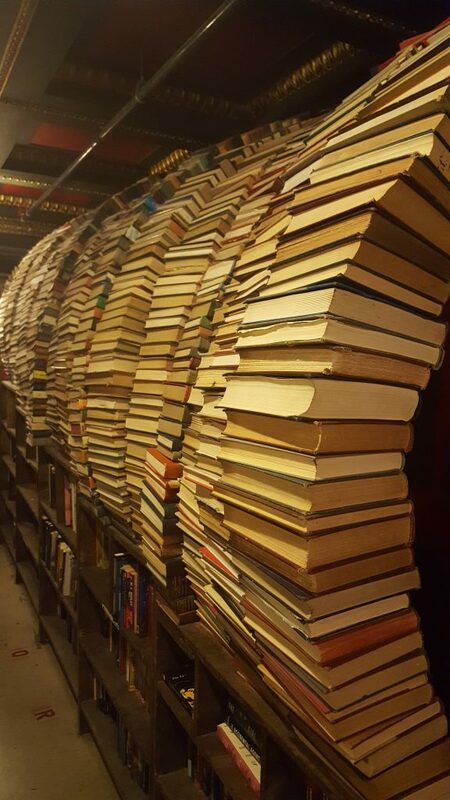 If these don’t interest you, keep walking through to the book tunnel. Yes! 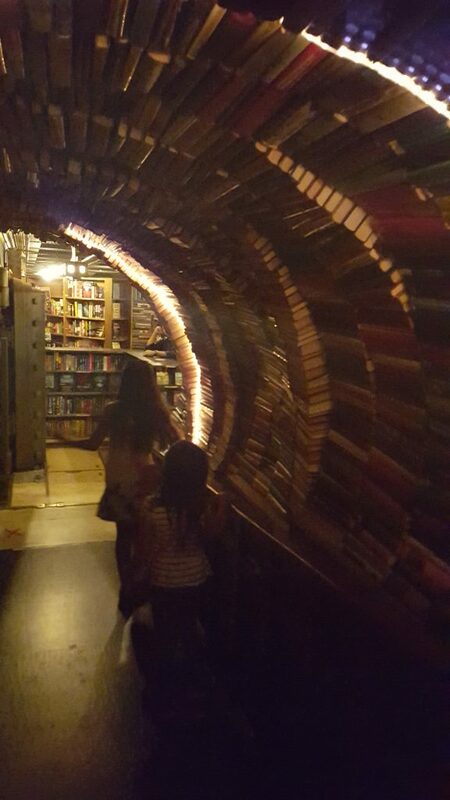 It’s a tunnel made out of books!!! 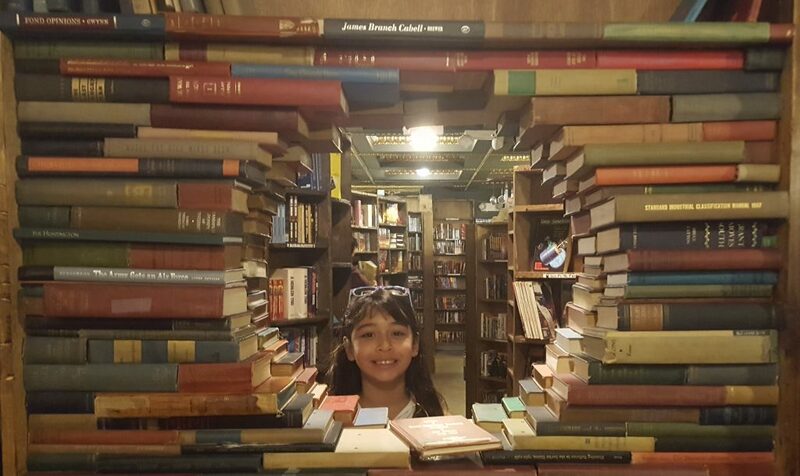 I imagine that Belle must have felt the same way when she discovered the huge library in the castle, as I did when I was walking through tunnel of books. Seriously, I love books and never would have imagined that something like this exists. Walk just a little further and you will find another picture opportunity. 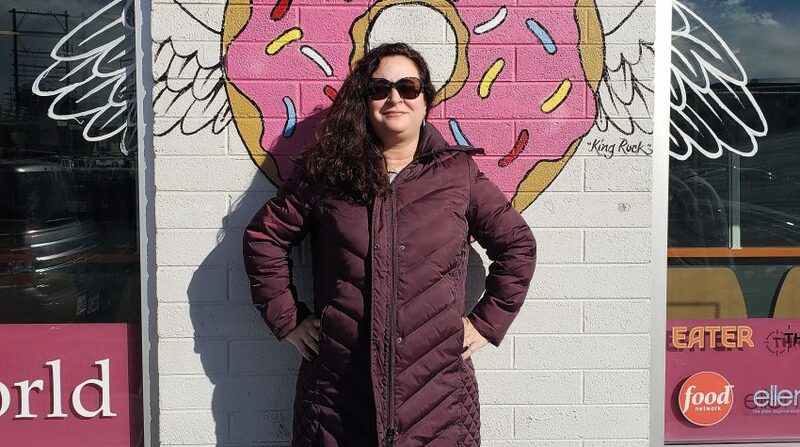 Have your friend, kids, or date stand between the book portal for a picture. Your picture will literally be framed with books! In case you were wondering, we wound up buying a used book titled, Weird California. It contained pictures of various stops you can make throughout California to see weird and unusual things. What a fun find! Take change for meter parking. Check street signs to avoid being towed. Buy a book. This is an independent book store and we’d love to support them so that they stay around for a long time! Check out their vinyl record section! 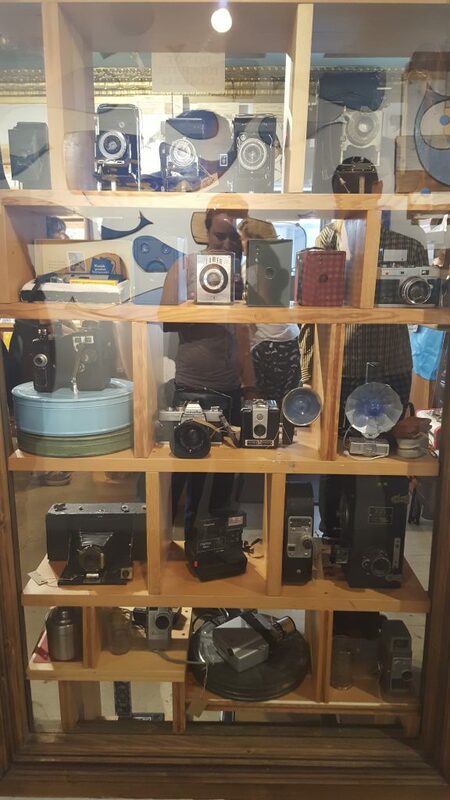 It was really cool to take a look at what they had. Walk into the old vault. How many times will you have a chance to do that? After our adventures at the Last Bookstore, we were ready for some lunch! 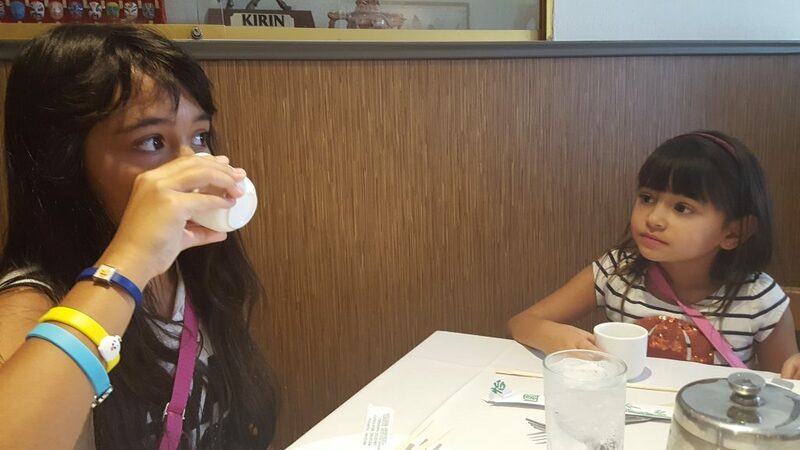 We headed over to Chinatown in Downtown Los Angeles. Make sure to drive in where you can see the beautiful Chinatown sign. It makes a big impact if you have little ones and it can make for a beautiful picture. Look around and you will see decorative touches everywhere, even on the crosswalk! Once we parked in a nearby lot, we walked down both sides of the main street. The kids loved checking out the small stores. There were all sorts of toys and knick knacks. The hubby bought some nunchucks and the kids loved it! The kids also got to see turtles, fish, and other creatures in the small market areas. 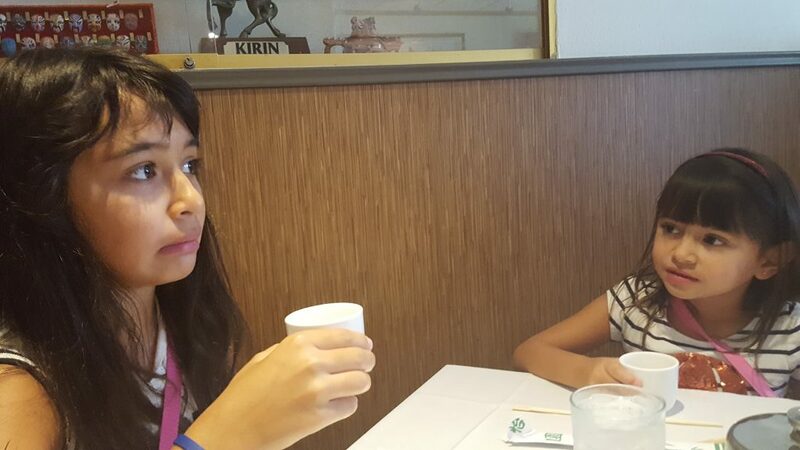 After walking around, we stopped in to eat at Yang Chow restaurant. The food is delicious and everyone enjoyed it. 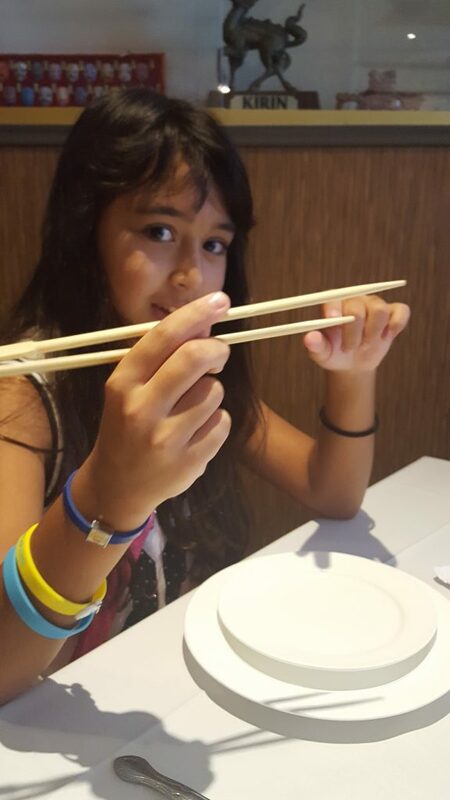 The kids especially enjoyed learning how to use chopsticks. The only thing they did not like? The tea. Be sure to take a day trip to The Last Bookstore and Chinatown soon. It is a fun adventure that all ages will enjoy! For another SoCal Day Trip idea, check out our post about Huntington Dog Beach here. The Last Bookstore is one of my very favorites as well as City Lights Booksellers in San Francisco. Sounds like a great day. You can also forgo the car and take the subway downtown… just about as long as it takes with all the traffic on the freeways in summertime! Thanks for the recommendation! We’ll have to check out City Lights Booksellers next time we go to San Francisco.